If you frequently find yourself facing difficult jobs, you'll appreciate having a heavy-duty truck. Anyone in Arlington looking for something they can count on can turn to us at 360 SMART CAR. 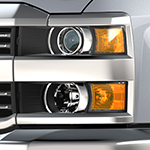 We have several different options for the Chevrolet Silverado 2500HD. The first thing you'll have to decide on is what type of engine you'd like. The choices are a Duramax 6.6-liter with 445 horsepower or a Vortec 6.0-liter with 360 horsepower. Both options are V8 engines, but the Duramax is a turbo-diesel. It has 910 pound-feet of torque and a maximum towing capacity of 15,400 pounds. The Vortec has 380 pound-feet of torque and can tow up to 14,400 pounds. With all that power comes a lot of generated momentum. To help with stability, the truck comes with Trailer Sway Control and Digital Steering Assist. It also comes with an Integrated Brake Controller for slowing things down safely.